New Technique Damage Calculators Released! PSOW is pleased to announce our Technique Damage Calculator available on the site to add to our current calculators. You can calculate precise spell damage given factors such as: Equipment Bonus, Class Bonus, Technique Level, and MST Level. We also have a Technique Damage Calculator for Windows made by our own Fanatic. So head to the Programs & Utilties section of Downloads if you want to download the Windows version or use the version we have on the site. lollipoplolita writes, " James Baxter's, MagFarm is now ver 0.9.7r2. You can download 0.9.7r2 from the same place. We're still continuously wanting feedback so James can improve the program. So please keep sending us your feedback so the program can have all the features you want! Update: MagFarm is now Ver 0.9.7r2. r2 fixes one or two small glitches and is not enough to notate a full 0.0.1 upgrade. Also, there is a new version now...built especially for MacOS Classic 8.6-9.2.2. " As far as we know, this should work on any version of OS X, but probably won't work on earlier versions (although the source code may well compile with minimal changes should anybody wish to give it a try). Since neither of the developers of PSOProxy have access to Macs, we've not been able to test this release as we would with the Windows and Linux versions, but it should work fine. As always, of course, you use it at your own risk. " 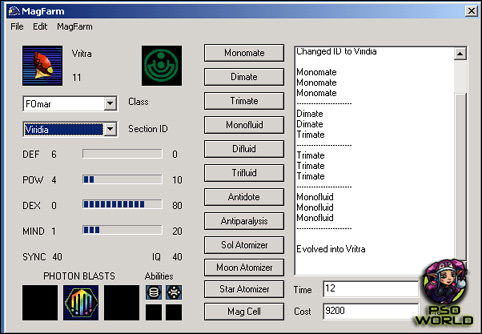 MagFarmer Goes Ver 0.9.6 And MagFeeder Now Available. lollipoplolita writes, " James Baxter's, "MagFarm is now ver 0.9.6. You can "0.9.6 from the same place. 0.9.6 fixes a minor cell bug in both versions of 0.9.5 and also a serious bug involving the set stats window for the windows version of 0.9.5. We're still continuously wanting feedback so James can improve the program. Another download mag utility is also available: MagFeeder by Link Lierok. MagFeeder works as a mag planner, you can input the desired stats you want from your final mag, and it will try to figure out the best way to raise your mag if possible. We would like to thank Link for this great contribution to PSO, it's players and community. You now have two really great mag utility programs to help you chart the growth and plan your mag! lollipoplolita writes, " PSO-World is proud to share with the PSO community a new utility program for mags by James Baxter, "MagFarm." 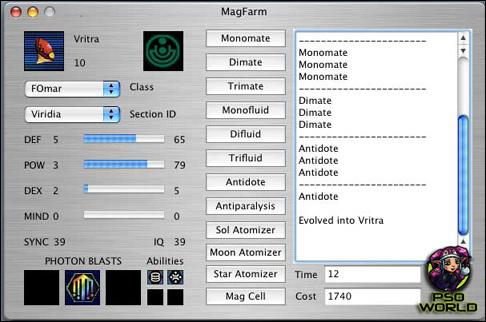 MagFarm v0.9 is a great new utility that is intuitive, simple and easy to follow. It also lets you track and plan your mag, it's stats, and even it's PB. It will also track time and cost required to build your mag. It's a complete mag planner that includes the new Ep 1 & 2 mags. I'm sure that this will come as a very helpful and useful tool for you mag farmers and planners out there. Please take note that MagFarm v0.9 is currently only in it's Beta phase; some of you might be able to tell from the ver #. Future additions include mag cell mags and other fixes and additions. The program is only at 90% of it's planned state. James would like to add: "There are other things I'd like to add after the final 1.0 release. When that will come about Iam not sure. It depends on the feedback. Ireally need help squashing bugs. MagFarm will be a work in progress and I'd love to keep adding things to it." So please give it a try, download it and give us some feedback by posting your comments or sending them directly to James. As some of you may know, James is also the man behind the utility program "Beat X", featured in our Downloads Section. We would like to thank James for this great contribution to PSO, it's players and community. We know he's been at work on this program for months now and a thanks is well deserved! Same here. Sometimes my dodges just DON'T WORK. The new requirement isn't implemented yet. It was only announced.